I've spent several hours today grading. Grades are due tomorrow morning, and due to issues with not feeling well this past week, I was left with more of it to do today than I planned on. But...sometimes I'm blown away by my students' writing. 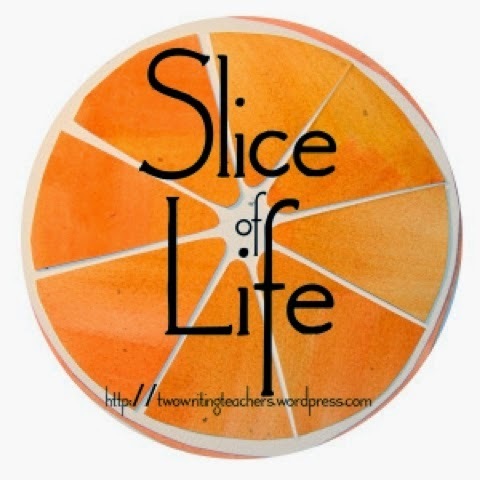 I'm so glad I've had them participating in the Slice of Life Story Challenge alongside me because I've been seeing such growth in their writing, and am finding ways to get to know them even better than I have prior to this. I know for sure this will be something I will have my classes participate in again in future years. Sometimes I laugh, sometimes I cry, sometimes I cringe, sometimes I smile, sometimes I gasp, many times I'm blown away by what my students are willing to write and share with me. I am thankful that some of them trust me enough to share some fairly deep and important things through their writing. Much of that is coming through most clearly when they experiment with writing poems. But at the same time, when I read things like this, my heart breaks a little bit for what some of them have to deal beyond the typical adolescent angst. And don't even get me started on how this student might have performed on a standardized test the next day if there had been one. I want to thank A for giving me permission to share this one on the blog. Her words got me thinking today and left me sitting for a few minutes just processing the power of such few lines. Wow, powerful is right. Please thank your brave student for sharing. I will be reflecting on this all afternoon, I'm sure. Beautifully written. What a great gift you have bestowed upon your students, the opportunity to find their words. I love doing the challenge with students because I learn so much more than what I would have in class alone! Reading your student's slice reminds me of The Freedom Writer's Diary that I read a few years ago. Reading our students' writing will show us things that may never be revealed any other way. Thank you so much for sharing! Having them participate in the slice of life challenge really is a gift! And wow what a powerful piece of writing by your student.